Browse our impressive range of industrial cleaning equipment and reduce the time needed to restore cleanliness to filthy, heavily soiled or contaminated sites. Built tough- to cut through embedded, stubborn dirt, grease and contaminants- our professional machines will leave your work site clean and sanitised, with minimal downtime. We manufacture and supply heavy duty floor scrubbers, floor suction cleaners, wet-dry vacuum extractors, industrial grade mops, conveyor cleaning systems and winery production line sanitising equipment. We also have industrial grade cleaning equipment for use in transport depots, large-scale automotive detailing and car yards, where throughput and professional results are important. The secret lies in the powerful, displacing ability of dry steam vapour, and its natural sterilising properties. Preheated to an exit temperature of 160 degrees Celsius, steam blasts away dirt, dissolves grease and sludge and completely eliminates all bacteria from surfaces it contacts. There's no need for chemicals- nothing survives the superheated powerful jet of almost-dry steam. For an industrial strength clean, this system comes out as the winner. We manufacture and stock- ready for immediate shipment- a comprehensive array of industry-specific machines, designed to start up almost instantaneously, and work hard all day- from one shift right into the next. Whether you have a small facility and need to be able to clean it quickly- or you manage a team of cleaners who work on a rotating roster of shifts- one of our machines will be just right for the job. Select cleaning equipment to operate with three phase power, or single phase- and know that your work will be easier and done better in less time than before. Why use steam to clean? 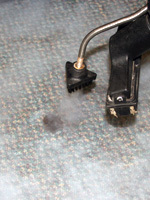 There are many benefits of using Tecnovap's steam cleaning machines compared to traditional cleaning techniques. Steam cleaners are the most efficient way to clean most surfaces as steam cleans and sanitises in the one action while leaving the surface mostly dry. This results in reduced cleaning times, more hygienic cleaning practices and environmental benefits with the reduction of chemical and water use. Whether you're a contract cleaner, health care professional, hospitality cleaner or a home owner, Tecnovap has the right industrial steam cleaner or steam vacuum machine for you. Tecnovap's Steam cleaning equipment can save over 80% of your current cleaning water and cleaning chemical use. Contact us today and see how a Tecnovap steam cleaning product will work in your facility and reduce your water and chemical use. At Tecnovap Australia we have been solving customer cleaning issues with our highly effective range of continuous dry steam cleaners and steam vacuums for over 25 years. With over 70 steam cleaning machines in the range we separate ourselves from the others by providing high pressure steam powered industrial cleaning equipment that is matched perfectly to our clients' needs.